It’s been a whizzbanging week full of inspiration from books and authors. I began the week with a visit to the Southbank Centre to see children’s book author Frank Cotrell Boyce read from his new book, The Unforgotten Coat. The book tells the story of two brothers from Mongolia, and their immersion into the little town of Bootle, England. The brothers’ new school mates are fascinated by their nomadic life in Mongolia and with the special coats they have. After the family is taken away in the dead of night, the students discover a coat is left behind in the classroom. It remains hanging there and serves as an ongoing reminder of the brothers. About 100 people came to presentation. Boyce read from the book and then opened up a dialogue with the audience. The children in the audience were well-familiar with his other books and asked a ton of questions – everything from what books he read as a child to where he found inspiration for his characters. Like his books, Boyce was warm, funny and thoughtful. He made a point to talk about the importance of reading for pleasure, and shared how meaningful books were to his life. He puts his money where his mouth is – he wrote the book to support The Reader Organization, a charity and social enterprise dedicated to making it possible for people of all ages, backgrounds and abilities to enjoy and engage in reading. 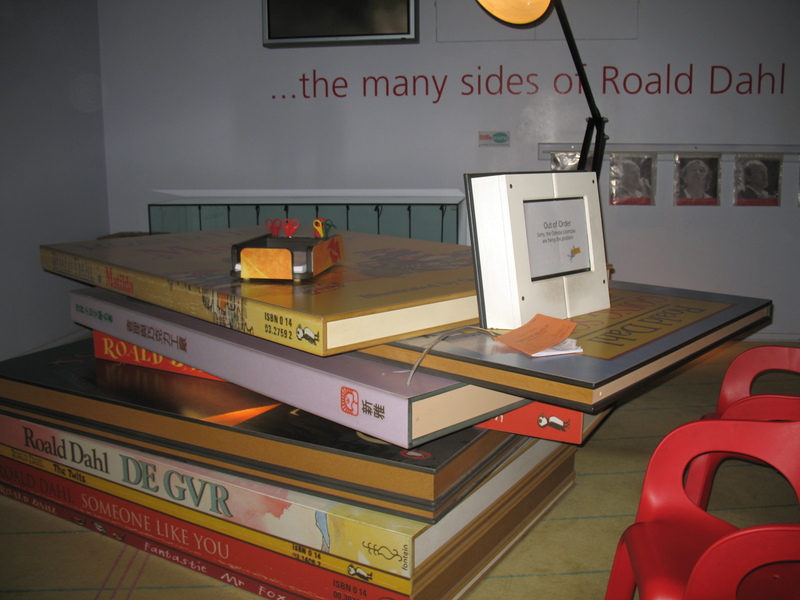 A few days later I headed up to Great Missenden to visit the Roald Dahl Museum and Story Centre. What a place! 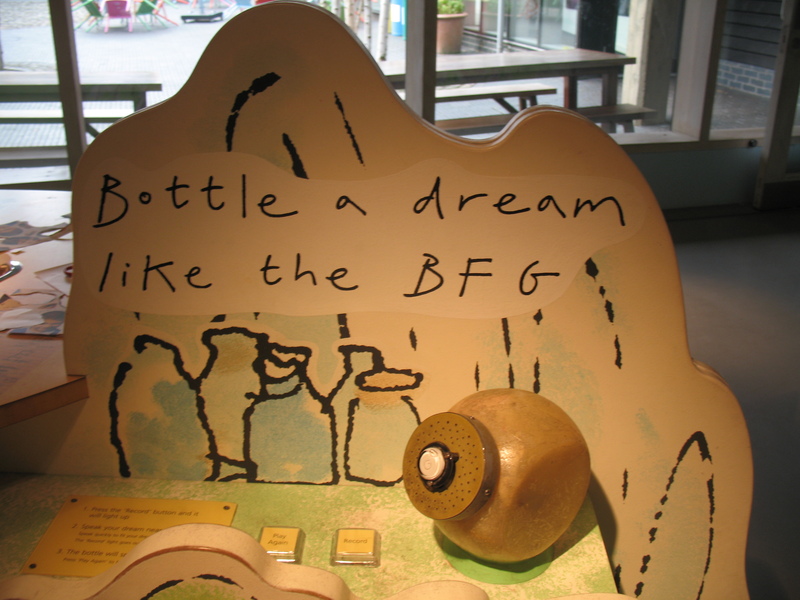 Full of energy, the Museum not only tells the tale of Roald Dahl and his books, it also inspires children to generate their own stories. 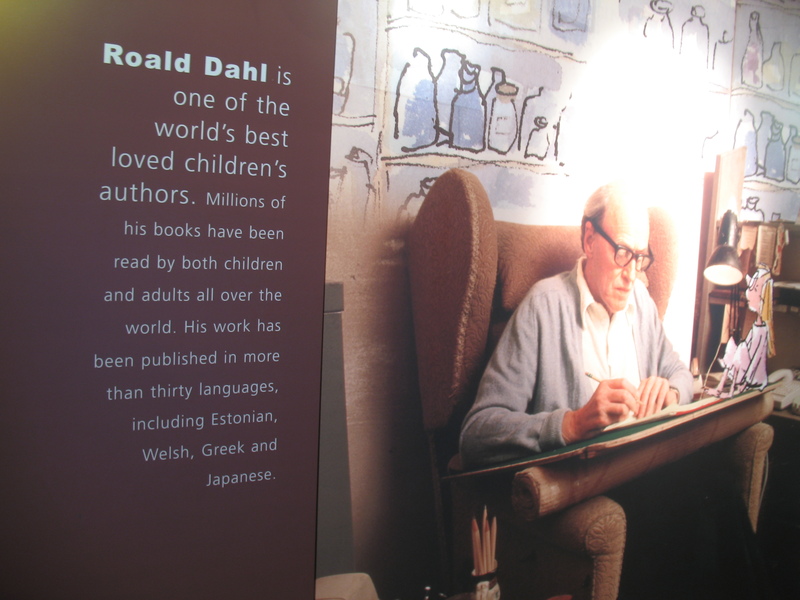 The Galleries offer dynamic exhibitions about Dahl’s life and books. Miss Honey’s Classroom offers space for school children to learn about character, plot and word play. The Story Centre provides children with places to devise and record their own stories. Bags of props, costumes, pencils and paper are throughout the facility to spark and capture ideas. 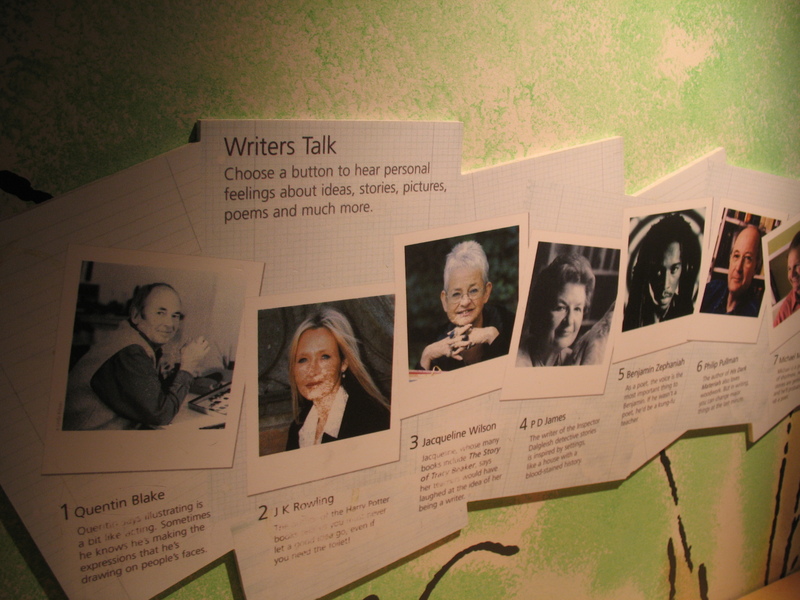 The Museum makes excellent use of technology to impart information, inspire stories and record them. You could listen to soundtracks of authors talking about how they wrote, you could record your own story ideas and play them back, and you could use props to film your story. 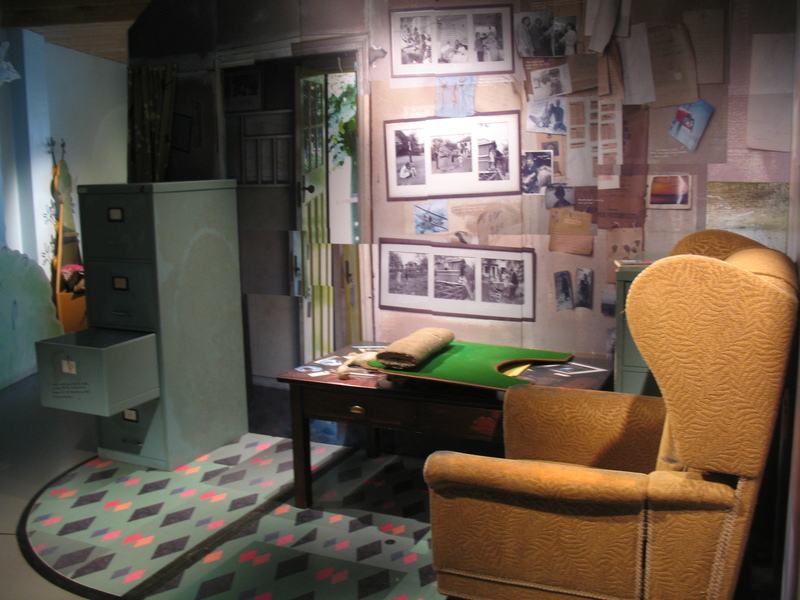 The Story Centre also houses a replica of Dahl’s famous writing hut so you could see how the master wrote his books. The Museum recently acquired Dahl’s actual writing hut, and will be under renovation this winter to incorporate it into the facility. The Museum and Story Centre also encourages its audience to wander through the town of Great Missenden and visit sites that Dahl frequented. A Village Trail takes you to the library, post office, train station and other buildings that provided inspiration for settings in Dahl’s books. 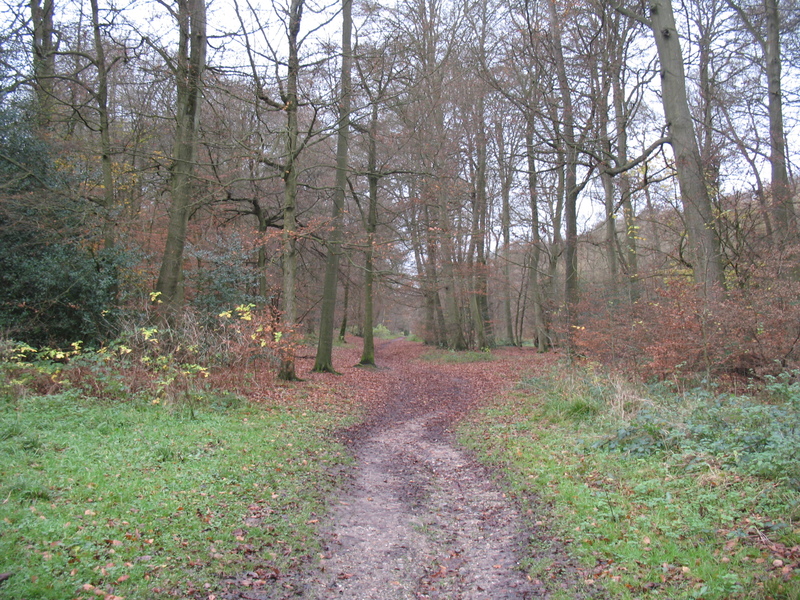 A Countryside Trail leads you through fields and woods that are featured in many of his stories. The trails are nearly as inspiring as the museum and the man. Saturday morning, I headed to the National Theatre to see a talk about the great Irish playwright Sean O’Casey. The Abby Theatre’s production of Juno and the Paycock is now at the National, and O’Casey’s daughter Shivaun, the Abby’s archivist Mairead Delaney, and playwright Frank McGuinness were on hand to discuss his work and life with moderator James Naughie. Actors from the Abby were also there to perform selections of his work. The audience of 300 or so got to hear about O’Casey the man, see play submission and box office records from the Abby’s archives (complete with scribbles from Yeats! ), and a working script from The Plough and the Stars. The 90-minute program ended with a recording of O’Casey himself, speaking on his views of theatre. To him, theatre should encapsulate all the arts – writing, music, design, architecture and painting – exactly what his plays do. The audience knew the writer and his works, and asked provoking questions about why he left Ireland, his relationship with Yeats, how he drew inspiration from the struggles of his time, and how he dealt with criticism from his contemporaries for his portrayal of it. Fascinating stuff. Present and past, writers have been capturing the world we live in so we can better see ourselves – or creating new worlds so we can gain fresh perspectives on ourselves. Some record the words heard around them to find sense and meaning during chaotic times. Others make up words to illustrate the new worlds they create. Either way, it’s captivating and whacktastic!